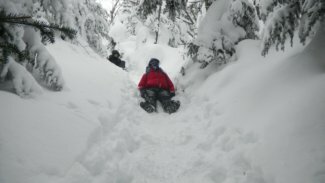 The traction of my MSR snowshoes was incredible and I didn’t slip on any of the steep steps. Aside from the directional work I had to do, the hardest challenge was the many ‘duck walks’. The duck walks occurred in areas where the trail brought us under a dome of branches piled high with snow, like a cave or tunnel. Occasionally an insufficient crouch or ‘duck’ would drop some of that snow onto a hiker, and I quickly learned to get very low for these sections. The sound and air pressure changes in these areas were some of the most magical snow silence and solitude that I relish. back roof of the hut. It’s is incredible to realize there is so much snow beneath you and likely the next time you’re on those same trails it would all be gone! We talked with several other hikers at the hut, and all who had attempted a summit had returned unsuccessful. We intended only to go the short distance further to pass tree line and feel a bit more of the full wind upon the mountain. We did this successfully, and we were very eager to get our group photo opportunity and then retreat to the slightly more sheltered region. Temperatures with the wind chill at that point were likely less than twenty below zero, and unless we were working hard or adding layers, it was no place to remain. Heading down with a very healthy feeling of accomplishment and very comfortable weather (though we knew it was still below zero with wind); we took a few opportunities to play. Most shed their snowshoes, as the hard-packed snow didn’t require them while on the trail. Striding off the trail to measure snow depth, we would easily drop to our waist, necks, or even further in the snow! Instead of the ‘bear bell’ method of direction I used on the way up, I was able to place my hand on the pack of another person and let him guide me along. Lack of snowshoes made this reasonable; though not sliding into my guide was a challenge at times. Another challenge was attempting to stay away from the edges of the trail, since I was not able to use my trekker poles while being guided in this manner. Physically, this was more demanding but mentally it was less so, and we made better time. Much thanks to Robbie and Sherpa for this incredible bit of work. They were fantastic and I appreciated it – although I must say that the independent feel of accomplishing a trail with them versus with Quinn is noteworthy. Some of the reward is in how we feel about ourselves, and without question, it was a great accomplishment! work and they did require rest at a few points. We were off the mountain by 3:30 p.m. and, as is often the case, feeling a lot closer for the time and accomplishments together.